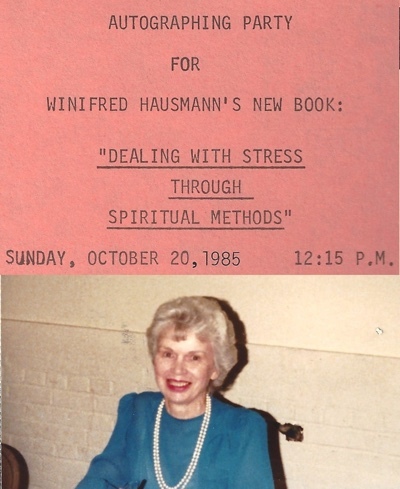 TruthUnity thanks the family of Winifred Wilkinson Hausmann for permission to digitize this book and make it available to the Unity community she served for so many years. Her blessings as a Unity minister and author carry on. During the last 30 years, as more and more people became concerned about stress as a factor in modern living, many books appeared on the subject, presenting exercises, mental and physical, for dealing with stress and living happily even under the difficult conditions of modern-day living. All of these methods are good and may be very helpful in handling the increasing tension and hurry that seem to pervade our world. But I felt that something further was needed — a spiritual guide to handling those stressful situations that arise in anyone’s life. Being a Unity minister and accustomed to working with spiritual principles in dealing with all of life’s challenges, I turned to the Bible for answers and found that, although the concept of stress as such seems to be a relatively recent discovery, the spiritual answers are as old as human kind, and they are carefully presented through allegory and instruction in the Scriptures. This book is designed to take time-tested, Bible-based principles and apply them to coping with stress in modern day life. I have attempted to cover the major areas of stress faced in twentieth century living, ranging from learning to handle time and money matters to coping with those sudden emergencies that frequently find today’s people so ill-prepared. It is my hope for you, the reader, that, whatever your need in these days of rapid change, you will not only find the answer to your challenges, but will also find fresh ideas that will lead to happier, fuller, more successful living in every way.